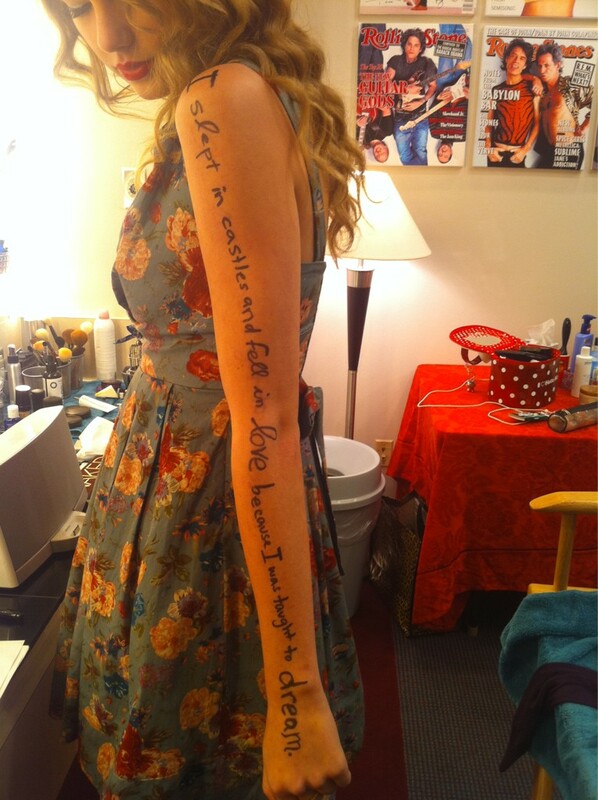 Here are Taylor’s arm lyrics. 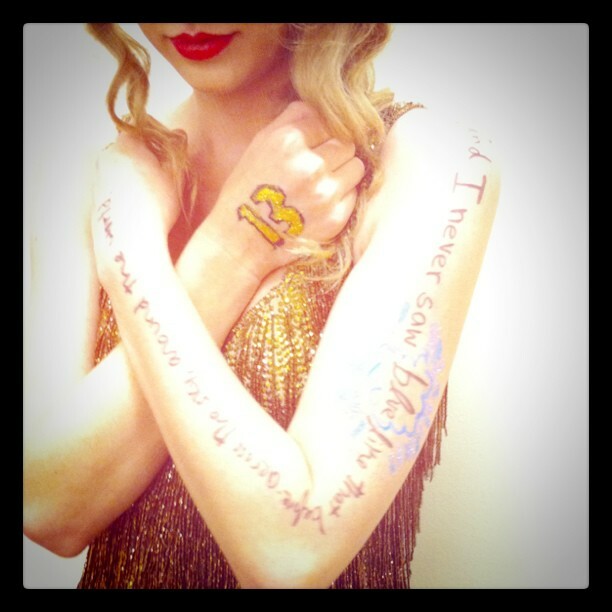 She started writing these from the Speak Now Help Now fundraiser/dress rehearsal in Nashville and continued to do so throughout the Speak Now Tour. “You’ve got every right to a beautiful life.” – Selena Gomez, Who Says. 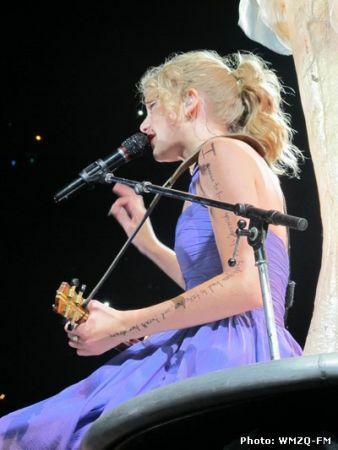 Bridgestone Arena in Nashville, Tennessee for Speak Now… Help Now! Fundraiser/Last Dress Rehearsal on May 21, 2011. “You gotta keep your head up but you can let your hair down.” – Andy Grammer, Keep Your Head Up. Qwest Center in Omaha, Nebraska on May 27, 2011. “I recommend getting your heart trampled on to anyone.” – Alanis Morisette, You Learn. Qwest Center in Omaha, Nebraska on May 28, 2011. “Cinderella said to Snow White ‘How did love get so off course? '” – Faith Hill, This Kiss. Wells Fargo Arena in Des Moines, Iowa on May 29, 2011. “And for one desperate moment there, he crept back in her memory.” – Tom Petty, American Girl. Bank Atlantic Center in Fort Lauderdale, Florida on June 2, 2011. “It took a while to understand the beauty of just letting go.” – The Dixie Chicks, Let Him Fly. Bank Atlantic Center in Fort Lauderdale, Florida on June 3, 2011. “I guess we’re all one phone call from our knees.” – Mat Kearney, Closer to Love. Amway Center in Orlando, Florida on June 4, 2011. “One life, you’ve got to do what you should.” – U2, One. Nationwide Arena in Columbus, Ohio on June 7, 2011. “I slept in castles and fell in love because I was taught to dream.” – Faith Hill, Fireflies. Bradley Center in Milwaukee, Wisconsin on June 8, 2011. “You better lose yourself in the music” – Eminem, Lose Yourself. Ford Field in Detroit, Michigan on June 11, 2011. “Remember me in ribbons and curls. Love, your baby girl.” – Sugarland, Baby Girl. LP Field in Nashville, Tennessee for the 2011 CMA Fest on June 12, 2011. “Love has a thousand faces.” – Randy Montana, 1000 Faces. Xcel Energy Center in St. Paul, Minnesota on June 14, 2011. “A moment, a love, a dream, a laugh, a kiss, a cry, our rights, our wrongs.” – The Temper Trap, Sweet Disposition. Xcel Energy Center in St. Paul, Minnesota on June 15, 2011. “Where I was born, where I was raised. Where I keep all my yesterdays.” – Montgomery Gentry, My Town. Heinz Field in Pittsburgh, Pennsylvania on June 18, 2011. “I am just a dreamer, but you are just a dream.” – Neil Young, Like A Hurricane. HSBC Arena in Buffalo, New York on June 21, 2011. “‘Cause when I close my eyes I’m somewhere with you.” – Kenny Chesney, Somewhere With You. XL Center in Hartford, Connecticut on June 22, 2011. “She said, ‘I think I’ll go to Boston’” – Augustana, Boston. Gillette Stadium in Foxboro, Massachusetts on June 25, 2011. “Like love from a drunken sky. Confetti falling down all night.” – Tim McGraw, She’s My Kinda Rain. Gillette Stadium in Foxboro, Massachusetts on June 26, 2011. “And we are just breakable, breakable. Breakable girls and boys.” – Ingrid Michaelson, Breakable in Greensboro Coliseum in Greensboro, North Carolina on June 30, 2011. “You won’t be the songs that I could never write.” – NeedToBreathe, Again. Thompson-Boling Arena in Knoxville, Tennessee on July 1, 2011. “When you’re alone you ain’t nothing but alone.” – Bruce Springsteen, When You’re Alone. Centre Bell in Montreal, Quebec, Canada on July 14, 2011. “Doing all the things that I neglected. I traded ’em all to be in your arms.” – Mandy Moore, Gardenia. Air Canada Center in Toronto, Ontario, Canada on July 16, 2011. “Belief builds from scratch. Doesn’t have to relax, it doesn’t need space.” – Gavin DeGraw, Belief. Prudential Center in Newark, New Jersey on July 19, 2011. “You’re someone else’s baby. Yeah you’re someone else’s crazy, now.” – Matt Nathanson, Queen Of (K)nots. Prudential Center in Newark, New Jersey on July 20, 2011. “I was only there to sing your song. What were you protecting yourself from?” – Jimmy Eat World, Mixtape. Prudential Center in Newark, New Jersey on July 23, 2011. “It’s been a long hot summer and I’m still trying to leave you alone.” – Mindy Smith, Love Lost. Prudential Center in Newark, New Jersey on July 24, 2011. “We all learn to make mistakes. And run from them.” – Paramore, Misguided Ghosts. Van Andel Arena in Grand Rapids, Michigan on July 28, 2011. “He’d look just like you’d want him to some kind of slick chrome American prince.” – The Killers, A Dustland Fairytale. Conseco Fieldhouse in Indianapolis, Indiana on July 29. 2011. “Don’t know why I’m still afraid if you weren’t real I would make you up” – Joseph Arthur, Honey & The Moon. Quicken Loans Arena in Cleveland, Ohio on July 30, 2011. “I guess to build yourself up so high you had to take her and break her down” – Keith Urban, Stupid Boy. Verizon Center in Washington, D. C. on August 2, 2011. “I dream of things that never were, and ask why not” – Robert F. Kennedy. Verizon Center in Washington, D. C. on August 3, 2011. This is the first time she uses a famous quote instead of a lyric. “Cause I live and breathe this Philadelphia Freedom” – Elton John, Philadelphia Freedom. Lincoln Financial Field in Philadelphia, Pennsylvania on August 6, 2011. “And up in the air they would write your name there, but love would fall to pieces in the rain.” – Patty Griffin, Christina. Allstate Arena in Chicago, Illinois on August 9, 2011. “If you wanna be somebody else, change your mind.” – Sister Hazel, Change Your Mind. Allstate Arena in Chicago, Illinois on August 10, 2011. “I got a good heart, I just can’t catch a break.” – Ryan Adams, Two. Scottrade Center in St. Louis, Missouri on August 13, 2011. “And the hardest part was letting go, not taking part” – Coldplay, The Hardest Part. Scottrade Center in St. Louis, Missouri on August 14, 2011. “Find the Grace in the things you can’t change, and help somebody if you can.” – Van Zant, Help Somebody. Rexall Place in Edmonton, Alberta on August 18, 2011. “Hey brother, we’re all learning to love again.” – Mat Kearny’s Learning To Love Again. Rexall Place in Edmonton, Alberta on August 19, 2011. “Don’t worry baby, everything will turn out alright. : – The Beach Boys’ Don’t Worry Baby. Staples Center in Los Angeles, California on August 23, 2011. “But my heart cried out for you, California.” – Joni Mitchell, California. Staples Center in Los Angeles, California on August 24, 2011. “Love actually is all around.” – The Troggs, Love Is All Around and intended reference to Taylor Swift’s all-time favorite movie Love Actually. Staples Center in Los Angeles, California on August 27, 2011. “I wish that I could have this moment for life.” – Nicky Minaj, Moment For Life. Staples Center in Los Angeles, California on August 28, 2011. “After all that we’ve been through, I know we’re cool.” – Gwen Stefani, Cool. HP Pavilion in San Jose, California on September 1, 2011. “For what it’s worth, it was worth all the while.” – Green Day, Good Riddance (Time Of Your Life). HP Pavilion in San Jose, California on September 2, 2011. “Tell me everything you want to hear – like that was your favorite year.” – Dixie Chicks, Favorite Year. Power Balance Pavilion in Sacramento, California on September 3, 2011. “You’re just somewhere that I’ve been and I won’t go back again.” – Selena Gomez, Ghost Of You. Rose Garden in Portland, Oregon on September 6, 2011. “You are the ever-living ghost of what once was.” – Band of Horses, No One’s Gonna Love You. Tacoma Dome in Tacoma, Washington on September 7, 2011. “There was always something that meant more to you than me.” – Jessica Andrews, There’s More To Me Than You. Rogers Arena in Vancouver, British Columbia, Canada on September 10, 2011. “Where were you when the world stopped turning.” – Alan Jackson, Where Were You (When The World Stopped Turning). Rogers Arena in Vancouver, British Columbia, Canada on September 11, 2011. “Be a best friend. Tell the truth. Overuse ‘I love you. '” – Lee Brice, Love Like Crazy. Bridgestone Arena in Nashville, Tennessee on September 16, 2011. “This one’s for the girls who love without holding back.” – Martina McBride. This One’s For The Girls. Bridgestone Arena in Nashville, Tennessee on September 17, 2011. “Love, save the empty and save me.” – Erin McCarley’s Love, Save The Empty. CenturyTel Center in Bossier City, Louisiana on September 20, 2011. “Do you realize that you have the most beautiful face?” – The Flaming Lips, Do You Realize. Bank of Oklahoma Center in Tulsa, Oklahoma on September 21, 2011. “I hope you know that even if I don’t, I wanted to.” – Rachael Yamagata, Even If I Don’t. Arrowhead Stadium in Kansas City, Missouri on September 24, 2011. “But it flew away from her reach so she ran away in her sleep and dreamed of paradise.” – Coldplay, Paradise. Pepsi Center in Denver, Colorado on September 27, 2011. “Little girl, you’re in the middle of the ride.” – Jimmy Eat World, The Middle. Energy Solutions Arena in Salt Lake City, Utah on September 28, 2011. “Just as free, free as we’ll ever be.” – Zac Brown Band, Free. Phillips Arena in Atlanta, Georgia on October 1, 2011. “No telling where it will take you, just live your life.” – T.I. [feat. Rihanna], Live Your Life. Phillips Arena in Atlanta, Georgia on October 2, 2011. “It’s easy saying nothing when there’s nothing to say.” – KT Tunstall, Fade Like A Shadow. Verizon Arena in Little Rock, Arkansas on October 4, 2011. “She’s out there on her own and she’s alright.” – Shawn Colvin, Sunny Come Home. New Orleans Arena in New Orleans, Louisiana on October 5, 2011. “A little voice in my head said don’t look back, you can never look back.” – Don Henley, Boys Of Summer. Cowboys Stadium in Dallas, Texas on October 8, 2011. “Through autumn’s advancing we’ll stay young, go dancing.” – Death Cab for Cutie, Stay Young, Go Dancing. KYC Yum Center in Louisville, Kentucky on October 11, 2011. “Can you still feel the butterflies? Can you still hear the last goodnight?” – Jimmy Eat World, For Me This Is Heaven. United Spirit Arena in Lubbock, Texas on October 14, 2011. “I hope to God I would’ve done something good with my life.” – Ronnie Milsap, My Life. Chesapeake Energy Arena in Oklahoma City, Oklahoma on October 15, 2011. “Memories fade, like looking through a fogged mirror.” – MGMT, Kids. Valley View Casino Center in San Diego, California on October 20, 2011. “May angels lead you in. Hear you me my friends.” – Jimmy Eat World, Hear You Me. Jobing.com Arena in Phoenix, Arizona on October 21, 2011. “Where love is just a lyric in a children’s rhyme, a soundbite” – Keane, Is It Any Wonder? AT&T Center in San Antonio, Texas on October 25, 2011. “And I never saw blue like that before. Across the sky. Around the world.” – Shawn Colvin, Never Saw Blue Like That Before. Frank Erwin Center in Austin, Texas on October 26, 2011. “Cause happiness throws a shower of sparks” – The Fray, Happiness. Rupp Arena in Lexington, Kentucky on October 29, 2011. “But darling, I wish you well on your way to the wishing well” – Patty Griffin, Nobody’s Crying. FedEx Forum in Memphis, Tennessee on October 30, 2011. “It’s love’s illusions I recall. I really don’t know love at all.” – Joni Mitchell, Both Sides Now. Minute Maid Park in Houston, Texas on November 5, 2011. “Birds flying high you know how I feel.” – Nina Simone, Feeling Good. Veterans Memorial Arena in Jacksonville, Florida on November 11, 2011. “I could rest my head knowing that you were mine.” – Guns N’ Roses, November Rain. St. Pete Times Forum in Tampa, Florida on November 12, 2011. “Just when the caterpillar thought the world was over, it became a butterfly.” – Anonymous. American Airlines Arena in Miami, Florida on November 13, 2011. “I feel lost again but this time for the best.” – Gregory & the Hawks, For the Best. Time Warner Arena in Charlotte, North Carolina on November 16, 2011. “We learned more from a 3 minute record than we ever learned in school.” – Bruce Springsteen, No Surrender. RBC Center in Raleigh, North Carolina on November 17, 2011. “Where would we be today, if I never drove that car away.” – Darius Rucker, Don’t Think I Don’t Think About It. Colonial Life Arena in Columbia, South Carolina on November 18, 2011. “May these memories break our fall.” – Taylor Swift, Long Live. Madison Square Garden in New York City, New York on November 21, 2011. “Bring all the pretenders, one day. We will be remembered.” – Taylor Swift, Long Live. Madison Square Garden in New York City, New York on November 22, 2011. “I am on a lonely road and I am traveling, traveling, traveling.” – Joni Mitchell, All I Want. Burswood Dome in Perth, Australia on March 2, 2012. “We sleep underneath the same big sky at night. And dream the same dream we can fly.” – Chantal Kreviazuk, In This Life. Adelaide Entertainment Center in Adelaide, Australia on March 4, 2012. “She said watch your back, I’m nobody’s girlfriend” – Matt Nathanson, Modern Love. Brisbaine Entertainment Center in Brisbane, Australia on March 6, 2012. “The war outside your door keeps raging on. STOP KONY 2012” – Taylor Swift, the Civil Wars and T. Bone Burnett, Safe And Sound. Brisbaine Entertainment Center in Brisbane, Australia on March 7, 2012. “Go cut through the noise so you can know what love sounds like.” – Natasha Bedingfield, Neon Lights. Allphones Arena in Sydney, Australia on March 9, 2012. “If things go right we can frame it and put you on a wall.” – Ed Sheeran, Lego House. Allphones Arena in Sydney, Australia on March 10, 2012. “We Love our lovin’ but not like we love our freedom” – Joni Mitchell, Help Me. Rod Laver Arena in Melbourne, Australia on March 12, 2012. “Last time I talked to you, you were lonely and out of place.” – Our Lady Peace, Somewhere Out There. Rod Laver Arena in Melbourne, Australia on March 13, 2012. “All romantics meet the same fate somehow.” – Joni Mitchell, The Last Time I Saw Richard. Rod Laver Arena in Melbourne, Australia on March 14, 2012. “Keep your feet ready, heart beat steady, keep your eyes open” – Taylor Swift, Eyes Open. Vector Arena in Auckland, New Zealand on March 16, 2012. 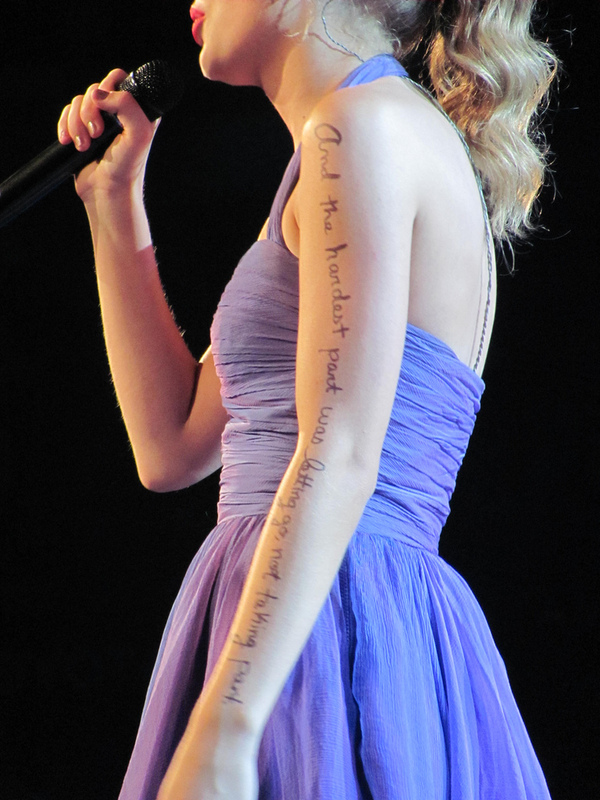 “Every lesson forms a new scar” – Taylor Swift, Eyes Open. Vector Arena in Auckland, New Zealand on March 17, 2012. “You know wherever I am, I’ll come running to see you again” – James Taylor, You’ve Got A Friend. Vector Arena in Auckland, New Zealand on March 18, 2012.